THE WORLD OF MILK is a leading specialised exposition of the dairy industry in Bulgaria, which will take place form 11 to 14 November 2015 at Inter Expo Center, Sofia. This event has become a hotspot for productive business meetings and an opportunity for business dealings between the Bulgarian dairy producers, sellers, and importers of milk and dairy products, specialised equipment and technology. The exposition which enjoys an ever growing interest from new participants will once again allow Bulgarian and foreign professionals in this industry to learn about the new products, machinery, and technology, and to make new business contacts. In parallel with THE WORLD OF MILK, the six exhibition halls of Inter Expo Center will host the international specialised expos MEAT MANIA, BULPEC (BAKERY INDUSTRY), WINE SALON, INTERFOOD & DRINK and SIHRE. The National Chamber of Winemakers offered a master class for wine experts – a vertical degustation of wine within the whole price range and degustation of local wine varieties from the Balkan region presented at Vinobalkanika 2014. 16,472 Bulgarian and foreign experts and members of the general public visited the expositions organised in 2014 – MEAT MANIA, THE WORLD OF MILK, BULPEK, WINE SALON, INTERFOOD & DRINK and SIHRE. Among the visitors were experts and guests from Bulgaria, Romania, Greece, Turkey, Serbia, Macedonia, Albania, Kosovo, Croatia, Russia, Moldova, Ukraine, Latvia, Kazakhstan, the Czech Republic, Hungary, Austria, Poland, Germany, Italy, France, Spain, UK, The Netherlands, Argentina, South Africa, and China. The parallel organization of the expositions and the informative business programme increased the opportunities for useful business contacts between the participants and the consumers of products and services in the two sectors – the food industry and the HORECA industry. Among the guests of the expositions were managers of food chains and stores, sellers and distributors of fast-moving consumer goods, restaurateurs and owners of pizzerias, pastry shops, hotels, coffee shops, and various points of sale with buffets. Come and meet your new business partners and customers! 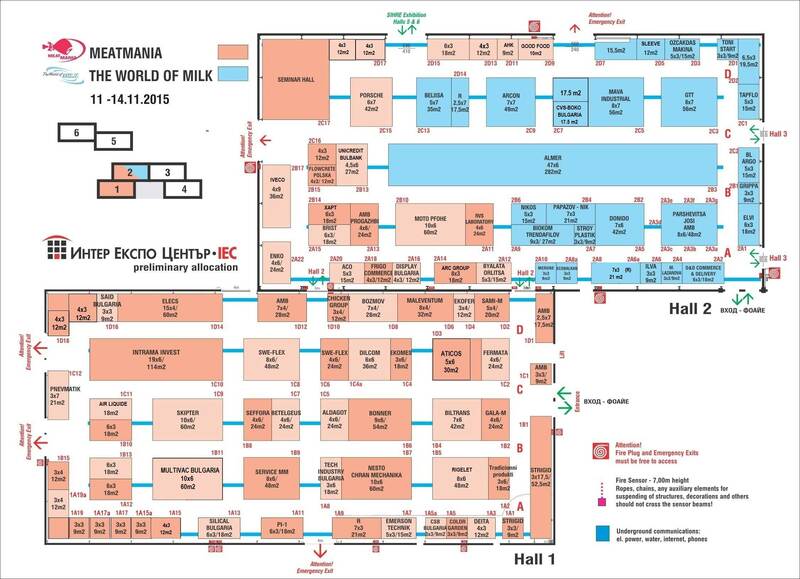 WE WILL BE EXPECTING YOU AT THE WORLD OF MILK FROM 11 TO 14 NOVEMBER 2015 AT INTER EXPO CENTER – SOFIA!